I'm lucky to know so many wonderful people! This card was made possible because Cindy (you can visit her blog here), my friend at The Stamp Shack, posted a swap. All we had to do was send a postcard to her which represented our country and/or city and give a little bit of information along with it. It was for her Girl Scout troop so they could gain knowledge of the world and earn their World Badge. The Shack has members from all around the world so Cindy thought this would be a wonderful opportunity for her GS troop. What a wonderful idea. In return for sending a single postcard, all participants received 12 stamped images back from the girls. Cindy, thank you so much and I hope the troop learned tons about people and places around the world. The card base is Wild Wasabi. I coloured the image mostly with Koh-I-Noor pencils and OMS. I love the way they blend. The tree was coloured using Copics and then I had a brilliant idea. Why not cover it in glue and pour Flower Soft on. I was hoping that with the red flecks it would look like Christmas lights on the tree. I think it does in the photo, more so than IRL. Usually it's the other way 'round. Anyway, I like the way it turned out. 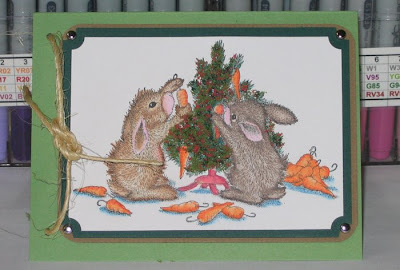 The image is mounted onto a darker green and a creamy caramel coloured bit of cardstock. I placed silver brads in the corner and added some twine I found while tidying up one of the storage cupboards. See, embellies come from all sorts of places! Sorry it's been a while since my last post, but I've been out "saving" even more money for GrampaStamper. 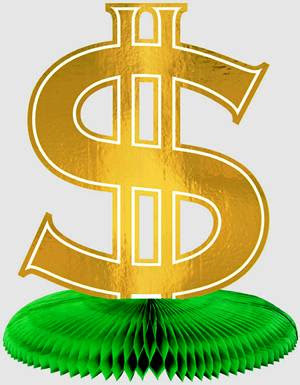 The best way to teach a theory is to turn it into a practical assignment, so in the past week or so, I've saved hundreds of dollars! Now, on to my most recent card creation. The card base is SU's Riding Hood Red and the patterned is from my stash and I've long since forgotten where it's from or who made it. It may even have been from the Stamp of the Month kit from last year. 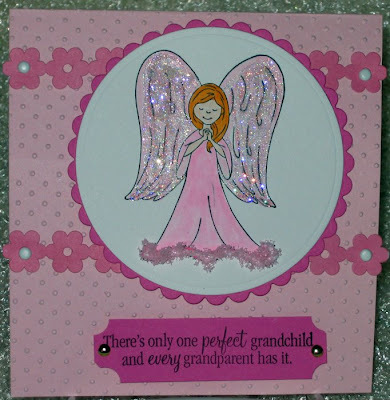 The image is from Paper Pretties which I stamped onto PTI's Select White cardstock and coloured with Copic markers. The sentiment was computer generated using a font called "Olde English" which is just perfect for Christmas. 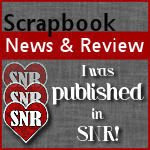 I also used in on my blog banner, in case you missed it. I still think the card needs something extra, but haven't quite figured it out yet. If you've any suggestions, please feel free to let me know. Well, I've got to get back out shopping and saving, saving and shopping so as not to let GramperStamper down. See you soon. Yesterday, we were watching “Sarah’s House” on HGTV. For those of you who haven’t seen this program, it’s about Sarah and her house and how she’s renovating it. Sarah is renovating her house. She noted that many, if not most, of her neighbours had backyard pools so she too wanted a pool. Her reasons were more towards enhancing the value of the property rather than “keeping up with thee Jones”. That’s a good thing. She was given a ‘rule-of-thumb’ of 10% of the property value for a pool. I forget the actual property value but it was between $550K and $650K. Being the TV renovating queen she is, she figured she could do this for $20K. She had plans drawn up and all was right with the world. Then the actual costs started to hit her with silly things, like local bylaws for fences. The estimate was soon just over $76K. She dutifully scaled her plans back and ended up with a backyard pool and cabana for $56K and … get ready … she shamelessly pronounced she SAVED $20,000! Yes ladies, she SAVED $20,000! She overran her budget by $36K and even overran the ‘rule-of-thumb’ by some $20K but she claims a WINNING DEAL! Now my DW is something like that and Lord knows how much I’ve SAVED over the years but now I find this is bigger than just my DW! My DW once bought a medium-expensive dress BECAUSE AN ACCESSORY WAS FREE! She SAVED money! Foolish me, I just thought the money went away but no … we SAVED again! Joe the Plumber gets a FREE sample faucet and decides to replace his old faucet. Let’s say the retail price is $100. He does the work himself in just under 2 hours, in his spare time and so the job costs nothing. How much has Joe the Plumber saved? Answer: NOTHING! He didn’t need the faucet in the first place! Anything greater than NOTHING is SOMETHING! It is ANTI-SAVING; it is UNSAVING! You NEVER save when you buy something! You might spend less than your neighbour for the same goods but you NEVER SAVE! SAVING is when you PUT THE MONEY AWAY SOMEPLACE! - Buying hundreds of dollars of fishing gear to catch three pounds a year is considered acceptable. - “Pimping out” your tractor is not considered excessive as long as the accessories are bought from a hardware store and not a trendy 'lifestyle emporium'. - God made hops and malt and so when your DH wants a beer, help him along with his religious experience and run to the store and buy him beer and sing HALLELUJAH! Well, that’s my opinion of ‘gender specific spending’. Or at least, that’s my opinion until told otherwise by my DW! The past three months have really taken a toll on my creativity as is evidenced by my lack of posts of cards. There have been three major life events: a death, a marriage and a birth. Any one of these events by itself will put the mind into a place of protection, all three of them in such a short space of time play absolute havoc with the ability of be creative. Now that our granddaughter has arrived safe and sound, I'm hoping that my desire to play will resurface, and soon with Christmas just around the corner. I have finally made two cards with a Christmas theme and, one day next week, I'm going to stay in my 'jammies' all day and just play with my stamps. In the meantime, here are my newest cards. The first card uses the limited edition of the Stamp Shack's Santa for 2008. For the past three years, Sherry has commissioned an artist to create a Santa and they were sold through the Shack website. This may be the last year as sales were a little lower than past years. Anyway, I love my Shack Santa's and look forward to using them over and over again. 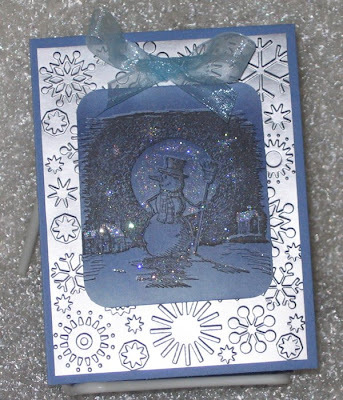 The base is Bordering Blue and I used my snowflake CB embossing folder for the silver cardstock. The image was stamped with black ink on white cardstock which I had covered in about four shades of blue to create a night sky. After stamping the image, I used my Quickie Glue Pen and Glamour Dust on the moon, stars and rooftops of the houses. I added a bit of pale blue sheer ribbon and attached it at the top of the image. It was quick, easy and could be a contender for my Christmas cards this year. The second card began with a craft cardstock base. 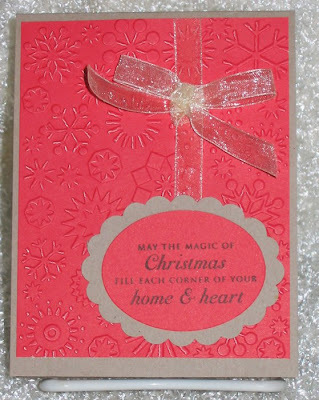 I used the same Snowflake CB embossing folder, but this time I distressed it a little bit. Instead of an image, I decided on a sentiment by Papertrey Ink, which was stamped on the same red c/s and attached to an oval using the Marvy Giga punch. It was also craft c/s. The sheer ribbon I used on this card is actually gold, but it doesn't show up too well in the photo. It looks much nicer IRL. Another quick and easy card to make. That's it for today, but I did want to post some cards finally. 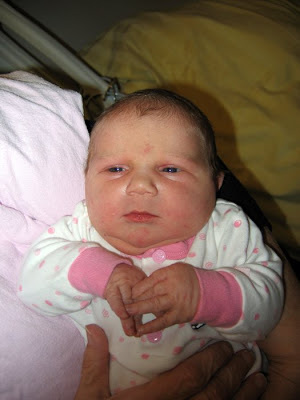 I went to the hospital to visit Ava last night. She really is the cutest little doll and her Mommy says she hardly ever cries and sleeps well. 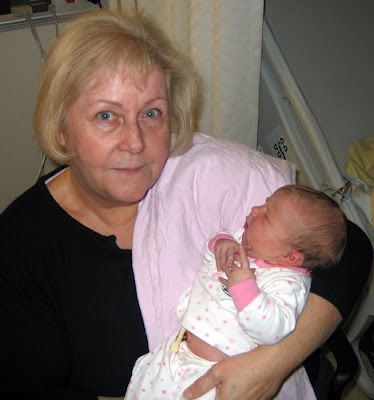 She was just about 18 hours hold when these photos were taken. I just can't hide my joy, can I? Mother and baby are expected to be home sometime this morning. How different it is now compared to when my own children were born. I can't imagine having the baby stay in the room 24/7, much less leaving the hospital after just over 24 hours. My goodness, one of the best parts of having a baby was the delightful 5-day stay when I didn't have to cook, clean or think of anybody except me and baby, when they brought the babies in from the Nursery. Except for feeding times, I could loll around and read magazines or chat with the other moms, or snooze. It was a little mini-holiday before the tough stuff started. I suppose, now that I'm thinking about it, having the time to bond with baby is way more important than sleeping and eating and being selfish, but there you go. Times change and so must we. She's here and only 6 days overdue!!! 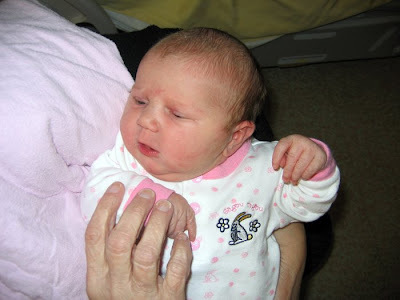 Our little granddaughter has finally arrived. We received the call early this morning to say she came into this world at 12:30 a.m., November 10th. Mother and baby are doing great and we'll get to see her later this afternoon. Visiting hours are from 4 p.m. to 8 p.m. and you can believe I'll be taking my camera. For now, all I have is the card you see above which I made in anticipation of this day. Check back this evening for her first "photo shoot".